Walnut City Council questioned Mt. SAC’s $14.5 million cost projection to move a controversial 2,200 spot parking structure during a study session Wednesday. The session was well attended by residents of Timberline, who live across the street from the sprawling campus in Walnut. Homeowners have fought the structure for the past year, saying it will damage the quality of their lives. The City Council has supported the residents and asked Mt. SAC to come to city hall to explain the other options studied for the parking structure. Mt. SAC President Bill Scroggins sat down to answer their questions. “Our board asked staff to look at two general alternatives. One would be to move the parking structure to another location, another would be to downsize the parking at the present location,” Scroggins explained. His staff estimated it would cost $14.5 to move the garage or $6 million to downsize it. Councilman Tony Cartagena asked for more information than the three page handouts brought by Mt. SAC. “Without that information, we cannot say whether this is accurate or not. Because the next step, we would like our city engineer check the other information you might have and figure out if the estimate could be cut,” Cartagena said. Mayor Pro Tem Eric Ching asked how much time had been spent on the analysis. Scroggins said his staff began working on it in mid-December and took a month of preparation. “One of the major factors is that we’re toward the end of the process of the development of the site — the architectural plans, state approval and site preparation,” said Scroggins. To move the structure, he said the community college would have to start from scratch, delaying it by three years. The Mt. SAC CEO added any delay would add 4 percent a year to construction costs due to inflation. Councilman Bob Pacheco questioned this inflation rate, feeling it should be closer to 3 percent. The Los Angeles Homeless Services Authority on Tuesday announced it will receive $91.9 million in funding from the U.S. Department of Housing and Urban Development to help the homeless. The federal funding includes the largest new grant in the nation — $10.1 million for 550 units of permanent supportive housing for chronically homeless individuals. The balance of the money will go to 231 other projects in Los Angeles and other portions of Los Angeles County. The grant was awarded to the Los Angeles Continuum of Care, of which LAHSA is the lead agency, through a national competition for bonus funding. The amount awarded was the maximum possible. “This $10 million in new homeless assistance funding is a strong vote of confidence by our federal partners in the work Los Angeles has undertaken to end homelessness,” said LAHSA Director Peter Lynn. The grant comes at a critical time, said LAHSA Commission Chair Kerry Morrison. “On the eve of the homeless count, where we so clearly see the need for more resources in L.A. County … (the award) presents a significant and much needed boost,” Morrison said. LAHSA is a joint powers authority of the city and county of Los Angeles, created in 1993 to address homelessness. A Fontana woman accused of killing six people in a wrong-way wreck last year on the 60 Freeway in Diamond Bar will face the charges at trial. A judge ruled today that sufficient probable cause existed to support the charges against 22-year-old Olivia Carolee Culbreath at the conclusion of a preliminary hearing in Pomona Superior Court. Culbreath has been charged with six counts of murder. She returns to court on Feb. 25 for arraignment on the charges. If convicted she faces a sentence of life in prison. Culbreath is being held at the Twin Towers Correctional Facility in Los Angeles on $6 million bail. The defendant was driving a Chevrolet Camaro on the 60 Freeway when she was involved in a wrong-way, head-on crash, the California Highway Parol said. Culbreath drove at speeds close to 100 mph. The car was headed east on the westbound 60 Freeway when it crashed head-on a sport utility vehicle, the CHP said. After the crash another vehicle crashed into the SUV. Two women in Culbreath’s car died as a result of the crash. One victim was Culbreath’s sister, Maya, 24, and Kristin Young, 21, of Chino. Four people in the SUV were thrown from the vehicle. The four victims, all from Huntington Park, were Gregorio Mejia-Martinez, 47, Leticia Ibarra, 42, Jessica Mejia, 20, and Ester Delgado, 80. Outgoing Board President Cindy Ruiz was honored for her outstanding service during the December 11 re-organization meeting. Shown with newly elected Board President Larry Redinger. 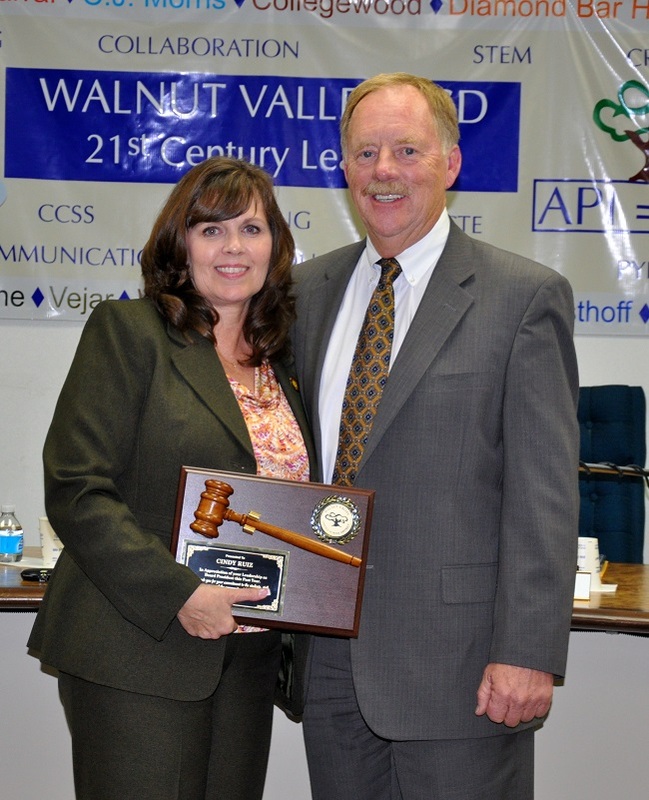 The Walnut Valley Unified School District Board of Trustees elected Larry Redinger as President, Helen Hall as Vice President, and Dr. Tony Torng as Clerk during the annual reorganization meeting on December 10. The new officers will serve one-year terms through December 2015. Trustee Cindy Ruiz was honored with an engraved gavel plaque for her service as the 2014 Board President. “Cindy has done an amazing job this past year. Thank you for your dedication to the District and especially for keeping things moving in a positive direction,” Redinger said. Despite opposition from neighbors, Walnut City Council has approved the construction of 13 new homes on 1.13 acres land at 650 Camino de Rosa. Council members gave the greenlight to the Walnut Esplanade project proposed by The Olson Company of Seal Beach. The five existing lots are zoned light commercial with a Montessori School and vacant property. Olson will build 13 single-family detached homes. The three- and four-bedroom homes will range from 1,733 square feet to 2,193 square feet plus two-car garages. In February, council approved the general plan to amend the city’s housing element to comply with state law. The update included three areas along Valley Boulevard that were rezoned to including a mixed use housing opportunity overlay to the existing zoning. Walnut’s Community Development Director Tom Weiner said the city had to identify space for 1,000 new homes for its “fair share” of regional housing needs. Instead of using open space or city parks for the homes, the city choose to designate the three Valley areas for high density housing projects. Walnut Esplanade will be built on land now zoned for 12-36 dwellings per acre. Originally, The Olson Company had plans for 14 homes on the site, but the planning commission had concerns about on-site parking. Original plans provided 3.5 spaces per home, but the developer agreed to eliminate one home to provide four parking spots for each residence. In addition to more parking, Olson added more landscaping and decorative pavers. In December, the planning commission recommended approval of the project to city council. A preliminary hearing for a Fontana woman accused of crashing her vehicle while driving the wrong way on the 60 Freeway and killing six people has been continued to Wednesday. The hearing for Olivia Carolee Culbreath, 22, which was to be in its third day Thursday, has been taking place at the Pomona courthouse of Los Angeles Superior Court to determine if there’s enough evidence to send the case to trial. Culbreath is accused of driving a Chevrolet Camaro east on westbound 60 Freeway in Diamond Bar on Feb. 9. About 4:45 a.m. the car crashed head-on into a Ford Explorer, the California Highway Patrol said. Following the initial crash another vehicle crashed into the Explorer. Two passengers in Culbreath’s car died as did four occupants in the Explorer who were thrown from the vehicle. Culbreath is charged with six counts of murder for allegedly causing the crash. Culbreath faces a maximum sentence of life in prison if she’s convicted of the murder charges. Culbreath, who is being held at the Twin Towers Correctional Facility in Los Angeles in lieu of $6 million bail, has been arriving in court in a wheelchair. At this point she is disabled and requires regular medical care, Culbreath’s lawyers said. “We don’t know if she’ll ever walk again,” said Daniel R. Perlman, one of Culbreath’s attorneys. The community is invited to the grand opening celebration of the Rowland Unified School District’s new Family Resource Center and Children’s Medical and Dental Clinic today from 2:30 p.m. – 5:30 p.m. The new 3,200 square foot wellness center was built with more than $750,000 in grants from state and federal agencies to replace the prior aging portable building. The center is located next to Northam Elementary School in La Puente (17800 E. Renault Street, La Puente 91744). The celebration will feature a ribbon cutting and presentations by dignitaries, tours of the new building, children’s activities, student entertainment by the District’s Elementary Mariachi Group, and resource booths. Elected Officials in Attendance Include: Los Angeles County Supervisor Hilda Solis, City of La Puente Mayor Viola Lewis and Mayor Pro Tem Dan Holloway, City of Walnut Council Member Mary Su, along with field representatives from the offices of Congresswoman Grace Napolitano, Congressman Ed Royce, Assemblyman Roger Hernandez, Assemblywoman Ling Ling Chang, and the entire RUSD Board of Education and Superintendent Dr. Julie Mitchell. Also in attendance will be key founders and community partners of the Family Resource Center and Children’s Dental and Medical Clinic. BACKGROUND: The Family Resource Center offers a variety of no-cost, low-cost programs and services to children, youth and families who reside in the communities served by the Rowland Unified School District (Rowland Heights, La Puente, Walnut, West Covina and Industry). It first opened in the Rowland Unified School District (RUSD) in 1995. The Children’s Medical Clinic provides free medical care on a walk-in basis for uninsured, low-income children 3 to 18 years old. It also provides free immunizations and Tdap Shots for qualifying students entering 7th Grade. It opened in RUSD in 1978. The hours are Mondays and Thursdays from 8:30 – 11:30 a.m. and 12:30 to 2:30 p.m. The SSG Children’s Dental and Outreach Project started in RUSD in a WWII trailer in 1974! It is open on Mondays, Wednesdays and Fridays by appointment only from 8 to 11:30 a.m. and dental treatment is free or low-cost for uninsured, low-income RUSD children 5 to 18 years old. To contact the Children’s Clinic & Dental Services the community can call (626)964-4798. The Rowland Unified School Board wants the state legislature and Gov. Jerry Brown to repeal the local reserves cap, saying SB 858 could force the 1,000 districts in the state to spend their $5 billion to $14 billion in reserves and that schools can’t survive another downturn without these savings. When voters approved Prop. 2, the Rainy Day Fund, it was tied to SB 858, which limits school reserves to two times the minimum allowed for economic uncertainties. Rowland officials say 3 percent is their minimum, but it currently maintains a reserve of $15 million — about 10 percent of its $155 million unrestricted budget. Lucy said school districts will have to spend the money they saved for school repairs, as well as retiree and employee benefits. Rowland officials note it could take many years for California to build up the Public School System Stabilization Account. Read more in Rich Irwin’s story RESERVES. The City of Diamond Bar’s City Clerk’s Office will be accepting applications until Friday, January 30, from individuals interested in filling a vacancy on the City’s Planning Commission. The term of office for this appointment will expire in 2017. To be eligible to serve as a City Commissioner, applicants must be Diamond Bar residents, at least 18 years of age, and registered to vote. Faculty is fighting a student housing proposal at Mount San Antonio College. A long line of professors told the Mt. SAC board of trustees that student housing wasn’t needed or wanted at the community college in Walnut. 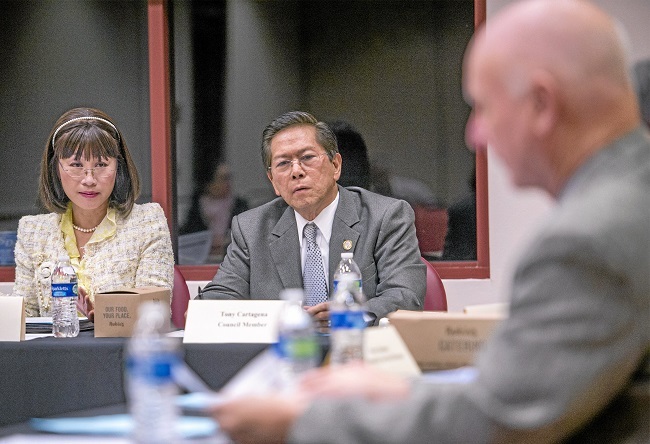 In March, President Bill Scroggins formed a student housing task force. He said Mt. SAC had been approached 18 months ago by an equity development group, Antarctica. So the two parties talked about the parking structure and the daily rates that could be charged. “That didn’t pencil out,” Scroggins said. They also talked about solar power fields. “Now, we (Mt. SAC) see with our incentives and zero-interest loans, we are going to build that cheaper than anyone else,” he said. The Mt. SAC CEO pointed out that the City of Industry had considered building student housing with redevelopment money on the west parcel. “Conversations with the Walnut City Council said ‘hell, no, we’re not going to have housing on Grand Avenue, but we’d be OK with housing over by Cal Poly,” Scroggins said. So Antarctica was asked to show that student housing was feasible. It had the Cokley Group conduct a student survey on housing. “They saw enough demand for at least 500, maybe 1,000 students in student housing,” Scroggins said. These documents were shared with the task force in September. The survey suggested housing would be attractive to athletes, out of state and international students. Read more in Rich Irwin’s story HOUSING.